On this week's show we'll visit the Carolines, have some musical capers, hear about some Maries, do some doodling and celebrate a few birthdays. 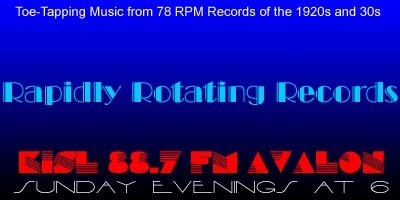 And, all but one record on this show are making their RRR debut! How do you know which one isn't? The one without the asterisk next to the title! * = Records being heard on RRR for the first time! *An Evening In Caroline – The New Yorkers / The Boswell Sisters, v.
*My Man From Caroline – Ben Selvin AHO / Eva Taylor, v.
*Just To Be In Caroline – Frank Froeba and His Swing Band / Tempo King, v.
*Campus Capers – Jesse Stafford and His Orchestra / Edna O'Keefe, v.
*Lo Doodle La Da Da – Willard Robison AHO / Murray John, v.
*A Shady Tree – Ideal Serenaders / Lewis James, v.
*Deep Night – Rudy Vallee and His Connecticut Yankees / Rudy Vallee, v.
*There's Always A Happy Ending – Nat Brandwynne AHO / Buddy Clark, v.